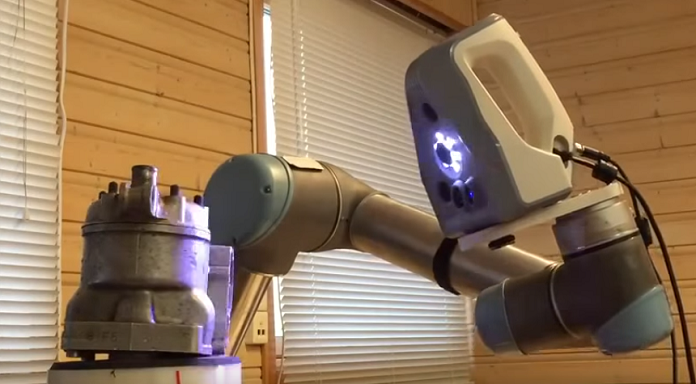 One of the latest examples of an Artec scanner built into an automated scanning system is featured in the video below, which was provided by a Norwegian 3D graphics, printing and carving company NorNet. They’ve recently bought a Spider scanner to digitize museum exhibits, such as woodcarvings and plaster figures, as well as car parts that are no longer available on the market. Then the 3D models of the scanned objects can be reproduced using a 3D printer or CNC machine. To see if the Spider measures up to their expectations, NorNet put the scanner to the test, mounting it to a robotic arm, Universal Robot 5 (UR5), which, according to NorNet, is quite easy to program and safe for people. For instance, if the robot hits something, it stops. To practice automatic scanning, Eriksen used an old motorcycle engine, which has some very elaborate curves and holes. The engine was placed on a rotating platform and the Spider was fixed to the robotic arm to move around the scanned object. The robot fitted with the Spider identified areas that needed to be rescanned on the go to eliminate holes in the final model and simplify post-processing.